I'm not sure if you've noticed but I certainly have, Rosehip Oil has taken over the beauty world by storm. Rosehip Oil has been used for centuries for it's potent skin regeneration properties, helping to nourish the skin and achieve a radiant glow, but it first popped up on my radar when I saw some of my other blogger friends talk about it in their video and blog posts. One friend even raved about how Rosehip Oil helped grow her eyelashes longer and thicker! You could say I was definitely intrigued, so I wanted to find out what this 'miracle' oil could do for me. 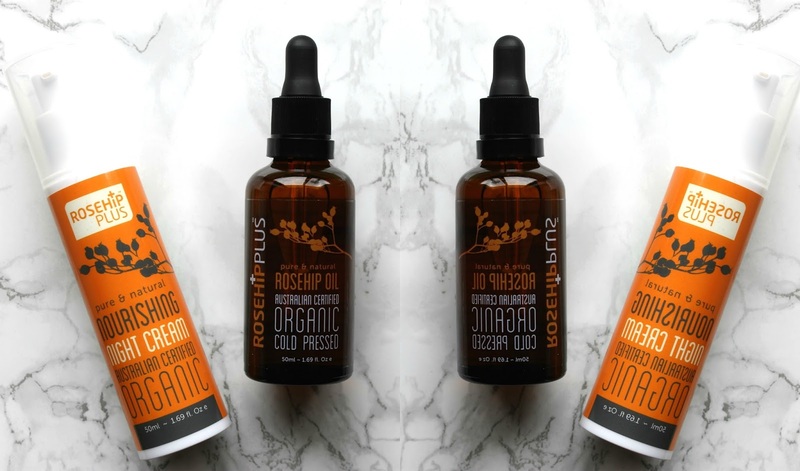 Rosehip Plus were kind enough to send me their range to review, so I've got the 411 on all things Rosehip Oil. 100% Pure Australian Certified, Organic Cold Pressed Rosehip Oil is free from preservatives, colours and added fragrances. Rosehip Plus' Rosehip Oil contains, 80% essential fatty acids Omega 3, 6 and 9, antioxidants such as Lycopene and Beta-carotene, anti-inflammatory Vitamin E and anti-ageing Vitamins A and C.
Sounds great, so what is it supposed to do? Rosehip Oil can help reduce the appearance of stretch marks and scars, improve the appearance of dry skin and maintain your skin's hydration. It also helps to promote skin elasticity and texture and diminish the appearance of fine lines and wrinkles, repair sun damaged skin and reduce the appearance of skin pigmentation. The first product I'm really a fan of is their Nourishing Night Cream* which I love to use after cleansing at night on my face and décolletage. I find that it gives me that boost of hydration my skin is looking for, especially as I'm winding down for the night it's a really beautiful, nourishing cream. I tend to opt for a heavier moisturiser at night as I usually try to mattify my skin as much as possible throughout the day and I find adding this extra hydration step to my skincare routine helps to keep everything balanced and my skin in check. The first thing I have to get off my chest is the smell of this oil*. It's quite potent so I think it's a love it or leave it type of situation and while I'm not the biggest fan, I will put up with it for the great benefits I see happening to my skin. My favourite way to use this oil is to mix in a few drops with my foundation a la Wayne Goss and it totally just smooths out any lumps and bumps or dry patches in my skin and my foundation applies and buffs like a dream. Honestly, if you can get past the smell in the first 30 seconds of applying this to your face, it's all hunky dory. Have you ever tried adding Rosehip Oil to your skincare regime? I have not heard of this before today! This seems like great product! Not a fan of the weird smell tho! It's a great product and the oil has really been helping me sort out the dry patches I have been getting on my cheeks lately. I have adjusted to the smell! Must say I've tried Argan oil but never rosehip oil. You got me nervous about the scent so I'll definitely need to give it a sniff first. Definitely sniff first, but it would totally be worth it! I think you will love it Sam, it's so worth checking out!